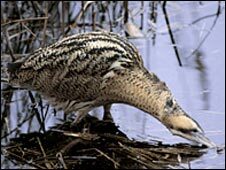 A Nottinghamshire nature reserve said the number of rare bitterns visiting its reed beds had increased sharply. 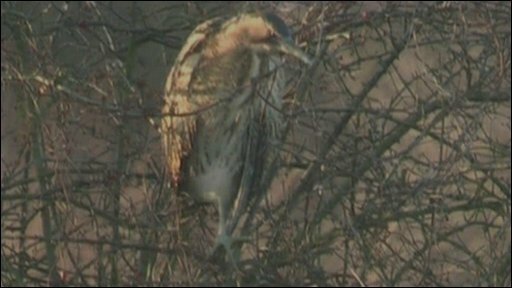 Wildlife experts said seven bitterns, which are related to the heron, have been spotted at Attenborough Nature Reserve in the past few days. Reserve spokesman Tim Sexton said: "It is extremely exciting news for the reserve as they are probably the most rare bird in the UK. "We normally only have between one and three of the birds overwintering." Mr Sexton added: "There are quite a few reserves across the country that have bitterns - but they only have one or two. To have seven of them is a huge percentage of the UK total." Staff said better management of reed beds has been attracting them to the reserve. Conservationists have been trying to restore reed beds in the hope of providing bitterns and other species with a safer place to breed. The birds' numbers also swell during cold spells as foreign bitterns fly in to avoid the continental chill. The bittern was declared extinct in the UK in the 1880s but has been brought back by conservation programmes. They usually live in the heart of dense reed beds and the males' highly evocative booming call to attract a mate and establish territories is often the only evidence of their presence. Recent research has put the species' population in the UK at 82 male bitterns.